Brazil is the largest country of Latin America, the fifth largest of the world. Its population is also big: 190 million people, the sixth largest of the world. Almost all Brazilians speak Portuguese and are undoubtedly a creative people: In the last few years, the country has been emerging as an important software maker. There is the famous Carnival and, of course, the football. In natural resources, Brazil is still big. This tropical country is rich in minerals and has a diversified and abundant fauna and flora. The rain forest covers half of the country. The long coastlines of the Atlantic Ocean shelters pleasant beaches and impressive landscapes. 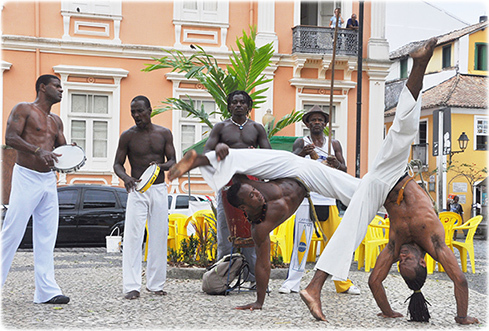 Capoeira is played at the Historic Center of Salvador. The Bahian martial art, played by the rhythm of berimbau, was created by the slaves in Bahia, around the 18th century. Copacabana beach, as seen from the Sugar Loaf, in Rio de Janeiro. Jardim Botânico (Botanical Garden), in Curitiba, Brazil. 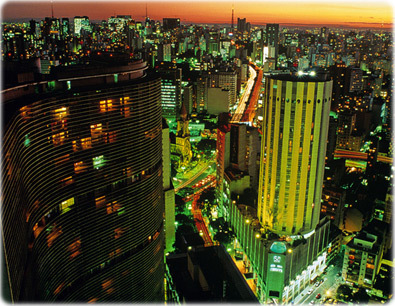 São Paulo, the Brazilian biggest city. Located in the south of Brazil, state of Paraná, Curitiba is internationally acknowledged for its innovative urban solutions. The city has an effective public transportation system and an exemplary policy on urbanism, education and environment. Copyright © Guia Geográfico - Brasil Turismo.